Futures Truth Magazine has been the leading source for system traders worldwide since 1985. 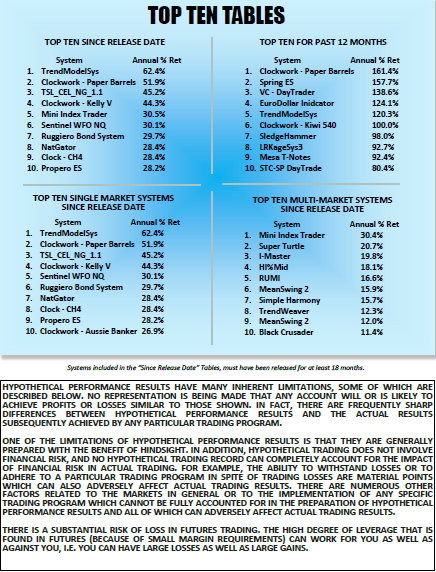 This quarterly publication tracks hypothetical performance of 200+ publicly offered trading systems. In addition to the magazine, Futures Truth has authored several books, created various trading tools to enhance your trading style, and offers services including programming and consulting. Have a question? Give us a call at (828) 697-0273 or email us at info@futurestruth.com. Futures Truth Magazine, Issue #1/2019 has just been published! Click on any issue to learn more and purchase a copy today! Click the following link to get to your free charts and indicators. Want to analyze the current markets? This free tool is very powerful and as you will see highly interactive and includes almost every indicator under the sun. Futures Truth was started in 1985 to bring truth to the Futures Trading System industry. The term system has been replaced with the more sophisticated sounding term “algorithm.” However, even though technology has improved order execution the algorithms that issue the trades have pretty much stayed the same. Now we are not talking about High Frequency Trading (HFT) where hardware and its relative location to the exchange provides arguably a quasi-legal approach to trading. We are talking about trading ideas or recipes programmed in today’s different programming languages that can be analyzed and back tested. That’s what we do here at Futures Truth. We put these software based trading algorithms to the test and report back on their success. The tests are outside the reach of the system vendors, so the results are what we call “achievable.” Meaning that there stands a relatively good chance that the simulated results we generated could possibly have been replicated in a real time setting. Who knows for sure how close the back tested numbers would have resembled a real account? But that is all we have to rely on – right? The beauty of algorithms is that they are purely defined by logic and math. These building blocks allow us to test, optimize and in improve historic performance in the hopes future performance [walk forward data] will also improve. Physical products may be returned for a full refund (minus shipping costs) within 30 days of purchase. Digital products are final sale due to the fact that they simply cannot be returned. Please read full product descriptions and ask any questions before ordering from our digital download store.